A golf specific conditioning program and quality fitting shoes are two ways to prevent injury on the links. Golf is not a game that is typically thought of as being hard on the body. However, the golf swing places great strain on several body parts in short intervals. The repetitive nature of golf, coupled with the strain placed on the body, is a good recipe for many types of injuries, including ones to the back, knees and elbows. Back injuries are the most common type of injury incurred in the game of golf. They are caused by the torque placed on the back during the swing. When the golfer takes his backswing, pressure is placed on the lower back that can cause lower-back strains and sprains that can take weeks to heal. Exercises that increase range of motion in the lower-back region can prevent a large portion of golf-related lower-back injuries. The golf swing can be stressful on the knee. When a golfer takes his backswing, he places pressure on his leading knee (left knee for right-handed players; right knee for left-handed players). This pressure can cause meniscus (cartilage) injuries that can take long periods of time to heal due to lack of substantial blood supply. Osteoarthritis is another common golf-related knee injury. This condition is caused by the repetitive nature of golf, which creates wear and tear on the joints in the knee. Golfers can help prevent knee injuries by properly stretching the joints in the knee during a warm-up session. Common elbow injuries produced by the golf swing are medial epicondylitis (golfer's elbow) and lateral epicondylitis (tennis elbow). Both injuries are caused by overuse. Medial epicondylitis often occurs when a golfer strikes the ground with his club before the ball, which can jar the elbow. 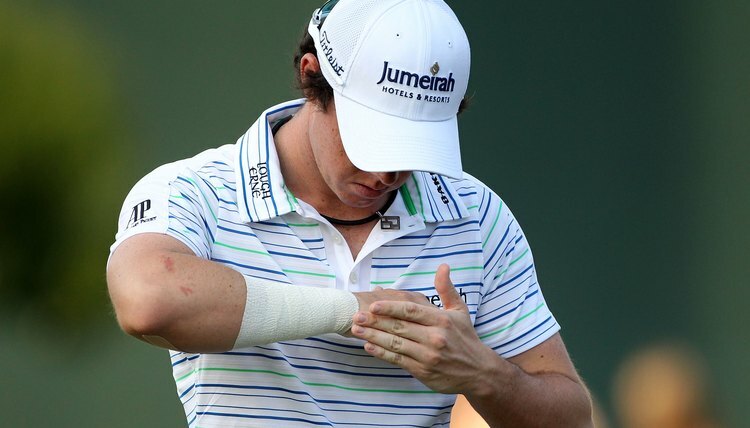 Stretching the elbow before playing golf can help prevent these injuries. A southeastern Ohio native, Justin Johnson is a finance professional with accounting and financial planning experience in various manufacturing industries. He discovered a love for writing as student at Pensacola Christian College and after learning many lessons in the workplace, he enjoys writing business and finance pieces.